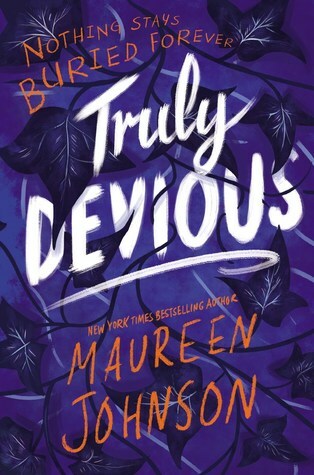 Truly Devious by Maureen Johnson. Stevie had no fears of the dead. The living, however, sometimes gave her the creeps. It had the feeling of a strange game, and one that filled Stevie with a low, simmering worry. Games are not fun if you don’t know you’re playing. Book titles are hard. I don’t say this as an excuse for every bad title ever made but from a sympathetic position. What I love about this title is that it so obviously states its intent. And that it works so well on so many levels for this book. I have disliked the analysis of poems and prose ever since my school days because I think that you kill words once you have to pick them apart, but I could easily write a whole essay on the title of this book. Which I won’t do, no worries, I’m just still quite captivated by all the layers. I might be a little cross with Maureen for writing this before continuing Shades of London (I really hope there is another book coming) but I understand that if something demands to be written it has to take centre stage (and all the other reasons her writing was delayed – those definitely take precedence). Luckily, this prominent spot is quite deserved. Stevie is a very compelling main character and I immensely enjoyed following her on her investigation. I also liked the dual timelines which don’t exactly interact but intersect and inform each other on a very interesting level, you basically get two stories for the price of one and possibly a third overlay. The nature of a mystery calls for inconsistencies so I’m not calling on them until I’m certain they aren’t intentional. I am very much looking forward to the continuation and how Stevie deals not with one but two discoveries/developments. And I really hope she solves at least the staircase riddle if not the whole thing, which feels very interconnected. Are you a mystery and/or crime reader? I’m usually avoiding them unless it’s an author I already know and trust. Share your teasers and preferences in the comments. I was just talking about someone I know who is creepy because she likes to talk about death. True words: Games are not fun if you don't know you're playing. This sounds like a book I'd enjoy. I love both mystery/crime novels. Hope this is a good read.